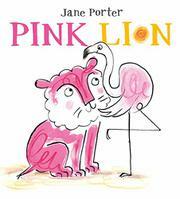 A story about a lion raised by flamingos and nature versus nurture. Arnold the lion is just as pink as his flamingo family members are, though the text doesn’t explain why this is so nor how he joined their family. All that matters is that he feels a sense of belonging with them. But then a pride of yellow lions appears and asks, “What’s he doing here? He’s supposed to be part of OUR family.” Arnold is “puzzled” but acknowledges that, apart from his coloring, he does look more like the lions than the flamingos, and so he leaves to learn to live among them. Despite his attempts, he never quite fits in, so he returns to the water hole to rejoin his flamingo family only to discover that a crocodile has muscled its way in and is demanding that they leave. This makes Arnold angry, and for the first time ever he lets out a big “RROOOOOOOAR!” The other lions hear him and run to his side. Together, they scare the crocodile away. They then form a peaceable kingdom of sorts with birds and lions (referred to as Arnold’s “new cousins”) splashing in the water hole together. Throughout, the illustrations’ boldly colored, limited palette and loose style add exuberance and fun to the telling of the story about identity and belonging.